If you want to create great projects on the internet, Dynamic Edge might be for you. The Veloce International team had the opportunity to try Dynamic Edge’s hosting solutions and will share some of the features of Dynamic Edge hosting in this article. As a business owner, you stand in front of challenges every single day. One of those challenges for business owners is their website. Websites are getting a bigger and bigger importance for businesses today. In fact, for many businesses, their website plays a central role in their business model. At the same time, there are many different challenges and things to keep in mind when it comes to managing a website. If your website isn’t working the way it should, you can be sure that you will lose customers, and therefore, it is crucial that you invest enough resources into making sure it is built to perfection. In this article, we’ll go through the importance of being up-to-date with your website and everything around it, and how you can use Dynamic Edge hosting solutions to do so. At the core of a successful business is a great hosting provider. Without a good service provider, you’ll end up with a slow website that will offer a poor site experience for your customers. 75% of consumers admit that they judge a business’ credibility based on their website design. Most consumers expect a web page to load in 2 seconds or less. 79% of shoppers reported that they would not return to purchase from a slow loading website. These two statistics only scratch the surface. And having a good website starts with having a good host. Dynamic Edge offers one basic package with 1 GHz CPU, 1 GB RAM, and 50 GB SSD memory and costs of $195 per year. If you need more resources, you can use AutoScaling of resources as a pay-per-use plan. The benefit of Dynamic edge is that the entire platform is built on their own technology, enabling them to build and develop it from the ground up. Many business owners simply take the first website host for their website, but the problem with this is often that they forget or neglect crucial parts about their website. In the end, this, of course, hurts the user experience. We have tried a lot of different hosts over the years for Veloce International, but have had a hard time finding hosts that work flawlessly. The common issues we have experienced with most hosting provides is constant notable slowdowns in particular as website owners we can not afford to run our sites on hosting that cannot provide a good stable service. A slow websites always translate to low customer confidence in your business as well as irritating moments when working on your site. It is extremely frustrating (and time-consuming) when you have to wait for the host to load when you implement a new change. Thanks to the extra features provided by dhosting.com you can enable LiteSpeed caching, as well as enable CloudFlare from within the dPanel, thanks to this we had no issues at all with speed. There is a technical aspect that allows them to achieve great load times. Their infrastructure is based around SSD Enterprise storage and build upon LiteSpeed server technology. At Veloce International, we cannot emphasize just how important good support is from your host. Frequently, you will need to contact your host for various reasons, and it is always a real pain when the customer service is poor, representatives are not available, or simply cannot help. Dynamic Edge’s support works 24/7, and they use a dedicated ticket system. Before we select any host, we always make sure that their support and service is top-notch, and Dynamic Edge’s service certainly didn’t let us down. Many hosts’ support can only answer basic questions, but Dynamic Edge can help solve problems and provide pure optimization. We have migrated websites several times, and this can also be a time-consuming process that involves a lot of hassle. When using Dynamic Edge, they helped us with a free migration of our websites from other hosting companies with ease. dPanel is the place that integrates all your hosting management tools in one place from an easy to understand organized user interface. It’s built like a cockpit where you log in to one place and have full control over your database user accounts, FTP account, e-mail accounts, website server side settings, SSL configuration, domain settings, and much more. This management panel even enables you to install your preferred CMS such as WordPress, Joomla etc. wich one-click easy setup. Dynamic Edge built in dPanel helps you manage settings in an easy way, thanks to features like CMS auto installer it reduces the time needed to get a WordPress site going to a few minutes. You can just set up a site and have your login information ready to go ahead and start making changes to your new website. No need to do all the ground work such as uploading the files or doing database configurations, this saves you time and simplifies the process. The panel itself is divided into functional sections in a very intuitive and ergonomic way thus making things more organized, which in turn helps you more efficiently manage your e-mail accounts, websites and domains. Other hosting panels usually force you to log into different accounts to manageme these things, so it’s nice to see this combined in one place. We think anyone can find the dPanel useful and easy to use, as it doesn’t require any technical knowledge, and making changes feels like adjusting some settings in your phone. This is crucial as it enables many people access to get started with their ventures and start building amazing new blogs, setting up a new business, or launching a large ecommerce store. Dynamic Edge offers an AutoScaling function. 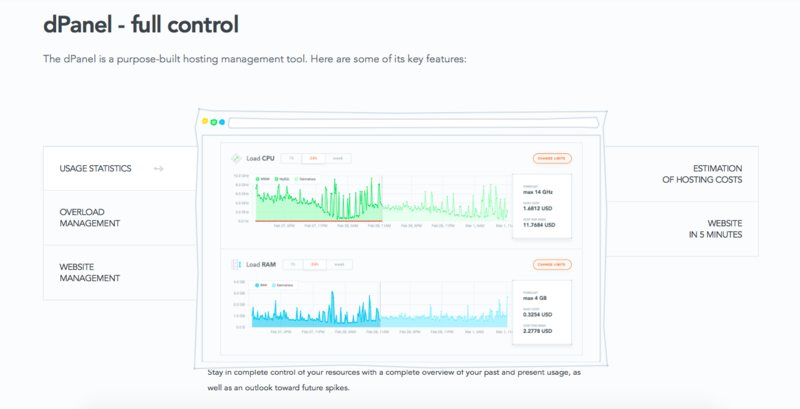 You need to enable this function, and to do so you need to first top up your AutoScaling balance, you decide when to enable this feature, and can set a spending plan to manage your costs. Good news for website owners like ourselves is that the service is scalable. If you exceed the base package for additional resources, they will only charge a flexible fee. This is different from most other similar services as in the case of dhosting.com most resources are billed on an hourly basis. 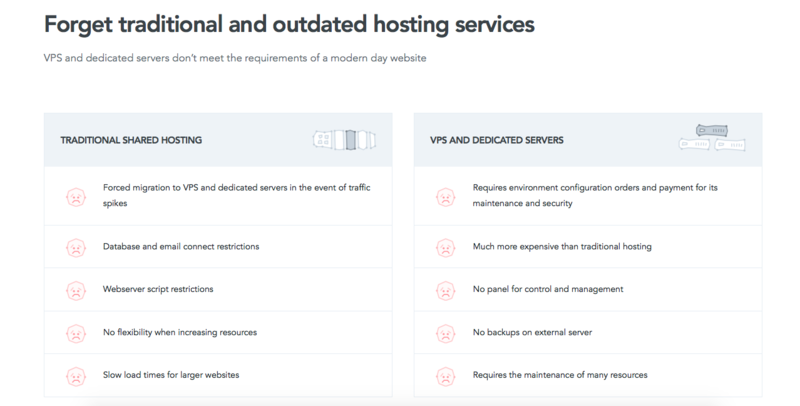 In the case of other hostings you need to choose a predefined hosting package, and as you can imagine, this can result in quite an expensive bill. As an example, 1 GHz additional costs $ 0.01 per hour and 1 GB RAM is $ 0.01 per hour. The benefit of this type of price plan is that you do not have to incur constant, high cost for an excess of power in relation to what you do not need at the moment. And using the Scaling Function, the service will increase the resources by itself, so that the website will operate at full capacity despite high traffic intensity. A problem that some website owners often face is sudden spikes in traffic. We have experienced this ourselves, and when you’re not prepared for it, you end up with the problem that your website loads extremely slow or that it downright crashes. This is, of course, terrible for business, so this is why it is important to be prepared. The AutoScaling function is latent, and the great thing about this is that when a traffic spike comes, you are prepared, and only pay for what you use. And the service has an impressive capacity as it can scale up to 24 GHz CPU, 64 GB RAM, and 1 TB SSD. SSL certificates are sometimes neglected, and while it is a small element of your website, it plays a really important role for user experience and website safety. Let’s Encrypt is an open source solution that offers free SSL certificates and a set of tools for managing them. 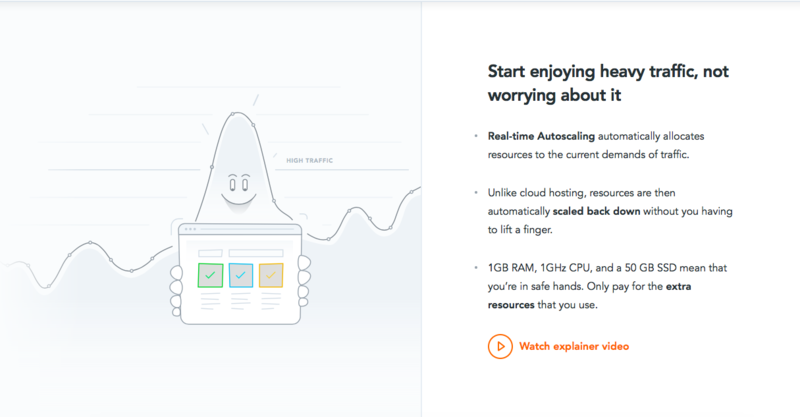 Furthermore, CloudFlare – provides a CDN (Content Delivery Network) service, which is a network of connected servers. Using this solution, all your traffic is automatically redirected automatically to a global network based on over twenty server locations, aimed at serving content from the server closest to the user. Thanks to this, the pages load much faster. And you know how crucial website load speed is for your business! Also, thanks to this, you are also able to filter out unwanted traffic, which translates into a smaller number of DoS / DDoS attacks. Let’s not forget the importance of backups of your website and mail, because this can cause real problems for website owners. If you haven’t backed up your website and something happens, you may risk losing months of work on your website – something that both costs tremendous energy, time, and money. Unfortunately, though, this is often something that many website owners pay little thought to. The email is also an important part of your business, and oftentimes, it’s even more problematic to lose months of mail conversations if you haven’t backed it up properly, as you oftentimes have to refer to previous emails. With Dynamic Edge, backups are made once every 24 hours, and each copy is stored for 3 days. All in all, we have only positive things to say about Dynamic Edge hosting, and we have nothing but positive experience from using it. 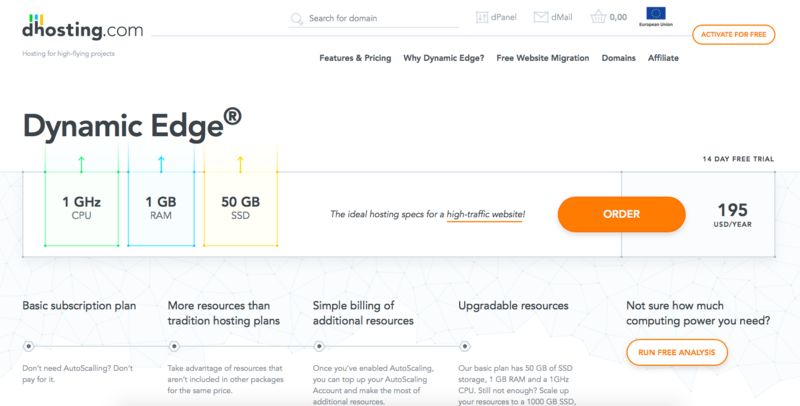 After having tried countless of hosts, Dynamic Edge is hands-down the most well-integrated, easy-to-use, and fast host that we’ve used over the years. Very informative review it gives some in-depth explanations about how the features work. I will be glad to answer any questions left in the comment section. I’m here to make things a little clearer as our service is quite unique.